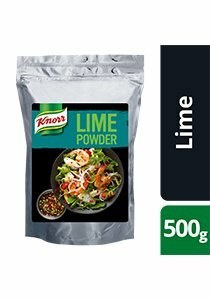 To make up 200 ml of lime mix, combine 50 g of KNORR Lime Powder with 150 ml water. Weight 500 g. Weight per serving/portion 5 g Dry weight. Made with real lime. Makes 2 L replaces 100 limes. Natural fresh lime taste. Available all year. Store in a cool, dry place away from direct sunlight. Re-seal pack after opening.